GTA chief executive Bimal Gurung today announced that he had sanctioned Rs 50 crore for the upgrade of the Mela Ground here to a modern stadium, but the project cannot be executed until and unless the land, which is with the Darjeeling Improvement (DI) Fund, is given to the hill body. Sources at the GTA said the estimated cost of the project that envisaged the construction of both indoor and outdoor facilities, along with proper seating arrangements, was Rs 105 crore. 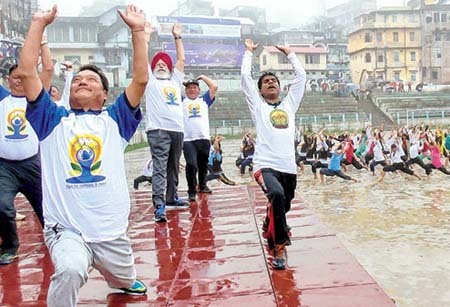 Addressing the International Yoga Day event at the soggy Mela Ground, Gurung said the project would be a gift to the people of Kalimpong, especially the children and youngsters. "Mela Ground is at the centre of the town. But its condition is like that of a paddy field. I have been trying to build a big stadium at the ground for a long time as a gift to Kalimpong. Just yesterday, I sanctioned Rs 50 crore to build a big stadium at the Mela Ground," he said. The Mela Ground with a measurement of 110ftX62ft hosts football matches once in a while and it has cemented galleries which are partially covered. The galleries can at most accommodate 5,000 spectators. Political parties and organisations hold meetings and other events at the ground. Although the GTA chief executive did not reveal the details of the stadium, sources said a Delhi-based firm had already prepared a detailed project report and the stadium, which would have both indoor and outdoor facilities, was estimated to cost Rs 105 crore. "To begin with, a start-up fund of Rs 20 crore from the Centre's special package has been set aside for the project. According to the chief executive's instruction, an e-tender will be called at the earliest," said a source. The bulk of the remaining funds for the project, the source said, would be sought from the Union sports ministry by taking the state government into confidence.